If I could wear one colour for the rest of my life it would be purple. The majestic hue of magic & mystery, it makes me feel at once both feminine and ferocious. So on a particularly rainy and dreary day this week, I decided to wear a monochromatic ensemble of purple on purple on purple on purple (you get the point!) and I loved the end result. 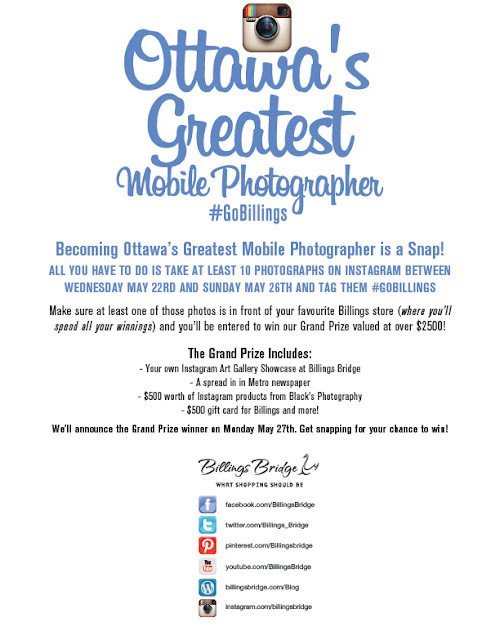 "an afternoon of celebrating photography, the arts, refreshments and prizes in support of the Ottawa School of Art. 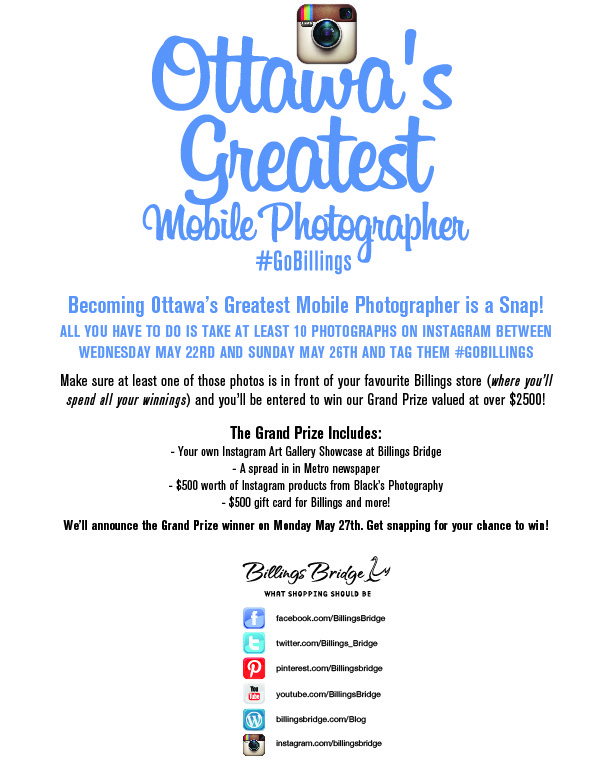 We are asking shoppers and tenants to Instagram their most inspiring and creative pictures and tagging them #gobillings for a chance to win the grand prize - an exclusive Billings Bridge and Blacks sponsored prize valued at over $2500." When I first moved to Ottawa and was attending Carleton University, I did my grocery and clothing shopping at Billings Bridge and so it holds fond memories for me. I am looking forward to reliving my University days tomorrow with some Billings shopping (who knows, maybe I'll buy something purple!) & hopefully some prize winning from the spinning wheel. Hope to see you there! While it's not my favourite colour, I'd go with blue. There are so many different shades of blue, from grey/steel blue to a shocking bright blue to a light sky blue. I could even likely convince some people that teal is blue! My colour if I had to pick one would definitely be green - it's one of my favourites for sure. Purple is such a regal color. I love it. Great outfit! I love your skirt and shoes!!! So cute! What beautiful color -- and marvelous on you. Your feet look fabulous. Purple looks great on you. If I could only where one color, it would have to be pink. Purple is definitely your color! You look fantastic in it! I honestly don't know what one color I'd wear for the rest of my life. It used to be purple like you - but now it might be peach or orange! You look amazing in purple! It's really a beautiful color and I loved your top, skirt and belt! It's difficult to answer your question... I love red and pink, but if I had to wear one single color forever... I was going to say I'd pick black... but maybe I would get pink... I don't know! Fortunately we can wear every nuance! It's difficult to pick only one, I see now! Good question! Sorry for not coming here before, I was sleeping due to my jet lag last week! This outfit is a hit Emily! You've really taken advantage of purple's versatility with all the different hues and textures in this outfit. The accessories (shoes and glasses) are FANTASTIC; you should wear those glasses more often!